A little while back I received an email from a gentleman asking me if I would be interested in reviewing a product on my blog in exchange for being sent the item. After looking over the link that he gave me I decided to go ahead and give his product a try so I sent him the shipping information and waited for the package to arrive. I received the pair of pinhole eyeglasses that you see me modeling within a week or so of our correspondence and set about testing them out. As some of you may recall, I've been having some issues with my vision lately especially when it comes to being able to read fine print. Without a pair of "cheaters", I can't read the back of medication bottles, small print in dim lighting, or thread a needle for love or money. The eye doctor told me that I'm not in need of prescription eyeglasses yet and he recommended I get a pair of reading glasses or two in the +1.50 magnification range. Those do seem to work but my failing vision has become one of the biggest frustrations of my advancing years - especially considering I can still things far away with no problems at all. I guess it's not so much that I need glasses but I need longer arms! Anyhow ... the technology behind pinhole glasses is designed to help correct vision due to eye problems like myopia (near-sightedness), hyperopia (long-sightedness), or problems related to computer use by blocking indirect rays from entering the eye and preventing them from distorting your vision. 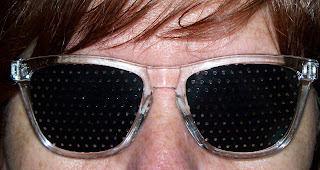 There's a lot of science behind how the pinholes work to make sure that only the right amount of light enters your eyes and affects your vision but not being the scientific type (give me History any day over Science!) it's all Greek to me. Regardless of how they work, I thought it might be worth giving them a try because if I can strengthen my eyes and keep from needing prescription glasses anytime soon, that's got to be a good thing - right? Well ... after trying the pinhole eyeglasses while using the computer, watching the TV, and reading I'm just not too sure how well I think they work. They shouldn't be used while you're moving due to the fact that they most definitely affect your peripheral vision and that could be dangerous in certain circumstances and they also can't be used in low-light environments because the pinholes reduce the amount of light entering your eyes to begin with so unless something is well lit, it seems really distorted. Looking at the TV from across the room while wearing them seems to work great but sitting at the computer - not so great. I can't really say at this point whether the pinhole glasses will have any affect on correcting my vision without using them for a longer period of time so perhaps I'll try using them from time to time while playing "Bejeweled" on the XBox and things like that to see if they can help with the Presbyopia (a condition in which the eye lens lose their ability to focus properly) that I seem to be suffering from. I know it's natural for people over the age of 45 to suffer from this disorder but that doesn't mean that there aren't things we can do to try to slow it down and keep from needing prescription glasses any sooner than I have to. After all, I do have that crappy health insurance that doesn't cover much at all when it comes to glasses! Of course don't expect me to wear these pinhole glasses at work or anywhere out in public - they aren't exactly the most fashionable things ever and it was bad enough I had to explain to the girls just what it was I was wearing never mind trying to explain that to the people I work with! Okay, this post cracked me up. I can just see you trying to explain these glasses to the girls! I visited this blog and found it very informatics. Thanks for sharing this information.